​One of the last "True" General Stores where you can find everything. Regardless of where you pitch your tent or hang your hat you are ALWAYS welcome at Gateway! Check out this webcam to watch whats happening on the lake! ● Take and bake pizzas. Sub sandwiches. Menu with lots of other food items. ​● Plumbing & Hardware, wildlife feed including cracked, whole corn and sunflower seed. Gateway General Store should be your first and last stop on your way to and from the lake! Coming to Kab with my family as a kid I knew this was truly a gem of an area with great people and a community that is always willing to help each other. It didn't take but one trip to God's country and Robyn was hooked! We wanted to be a part of that. 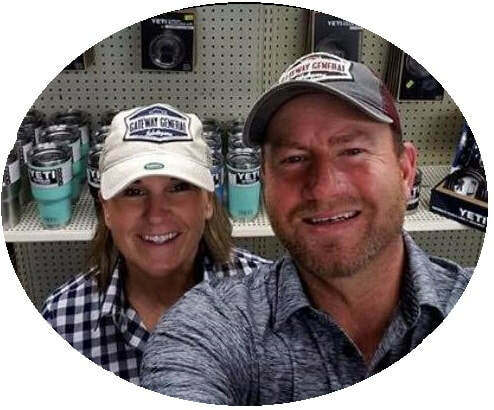 We started by purchasing a local resort and then followed down the same path of Phil and Ellen Hart, also owners of a local resort and Gateway General for over 20 years! It was an easy decision to make and along the way we have made great friends and couldn't imagine being anywhere else. Gateway Store is literally the gateway to Voyageurs National Park, Minnesota's only national park & the nation's only water-based national park! Voyageurs is a 4-season park with resorts open year round for great fishing, sightseeing, camping, awesome winter activities and the list goes on and on! Breath-taking scenery all season long! It has been a dream come true!